An Israeli worshipper has been killed and four others wounded in a shooting near a shrine in the city of Nablus in the occupied West Bank. The dead man, who was in his 20s, was a nephew of Israel's culture minister. The shooting reportedly happened before dawn as the group left a site known as Joseph's Tomb. 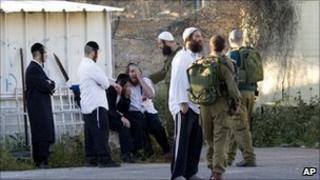 The Israeli military said the victims were shot by a Palestinian policeman. Palestinian officials say they are investigating what happened. In a statement, the Israeli military said Palestinian officials said the policeman opened fire "after identifying suspicious movements". Israeli Defence Minister Ehud Barak condemned the shooting. "No breakdown in co-ordination can justify an incident like this and firing at innocent people," he said. Reports said a car carrying the worshippers was fired upon as it was leaving the shrine following morning prayers. Ultra-Orthodox Jews regularly defy a military ban on entering the shrine, which is in Palestinian-controlled territory and is revered by Jews as the burial place of the biblical figure Joseph. An Israeli military official said the army co-ordinated monthly visits to the site to allow authorised access, and that one such trip had happened two weeks ago, Israeli newspaper Haaretz reported. A Palestinian spokesman said no such arrangements had been made for the Israelis who were fired upon on Sunday. "The main problem is that they [the Israelis] entered the city without co-ordination," said Jibril al-Bakri, the Palestinian governor of Nablus. He added that a Palestinian investigation was focusing on a Palestinian police patrol that was assigned to guard the tomb. It was the first fatal attack on Israelis in the West Bank since five family members were killed last month in the settlement of Itamar. Two Palestinian teenagers have been arrested on suspicion of stabbing to death Udi and Ruth Fogel and three of their young children.